Making small boxes is one of the most interesting and fascinating types of work that can be done on a lathe. The cover of the powder box, Fig. 59 at A, is turned from a piece of wood at least 1 in. more in diameter than the finished dimensions call for. This piece of wood is securely screwed to a faceplate or screw chuck, after which it is turned to diameter and leveled. It is best to turn the inside of the cover first, and then to cut the recess which fits into the lower part of the box. Use a template for this work. When the outside of the cover has been turned, it is cut off with a parting tool or skew chisel as near to the line as possible. Hold the parting tool with the right hand and grasp the lid with the left when it is cut away from the waste. Fig. 60. 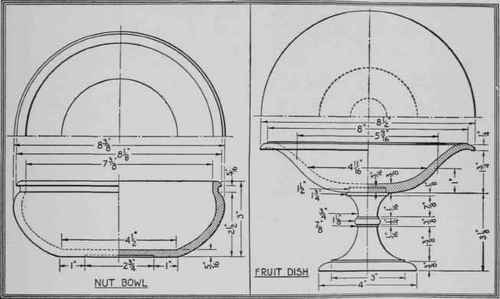 - Designs for a nut bowl and a fruit dish with suitable dimensions. Variations in the designs can be made to suit the individual taste. The lower part of the box is turned in the same manner as the tray shown in Fig. 57 at D. It is cut to approximate size, glued to waste stock (Fig. 59, B), and turned in the usual manner. 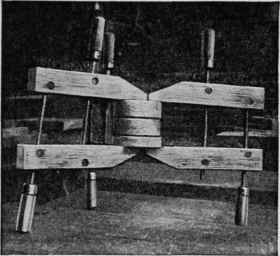 Particular care must be taken to turn the diameter of the opening so that the cover will fit snugly and yet not so tightly that it must be forced in place. The size of the opening should be tried while it is being turned by fitting the cover to it. The lower part of the box may be used as a chuck for the lid, which must be smoothed off and sanded at the central point where it was cut with the parting tool. The whole box is now stained and polished, after which its lower part is removed from the waste stock by driving a sharp chisel into the latter 1/16 in. 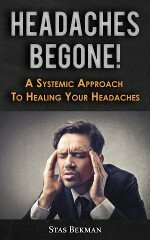 behind the glued joint. A recess may be cut on the underside of the box by chucking it as shown in Fig. 57 at G.
The jewel box, Fig. 59, C, is turned in exactly the same manner as the powder box; but as it is inlaid, the stock must be prepared in a different way. The lines of inlay are produced by gluing different colored woods together in layers. The lowest layer, for example, may be a dark-colored piece of wood, such as black walnut or imitation ebony, 3/16 in. in thickness. The next layer is a light-colored wood, such as maple or birch, 1/16 in. thick. This is followed by a dark layer 1/16 in. in thickness, and this again by a layer of light colored wood 1 5/16 in. thick. If these layers can be had in the thicknesses required, they may be glued up in one solid block as shown in Fig. 61. The block is then prepared and turned in the usual manner. If this is not possible, the following slower method is recommended: The lower part of the box may be built up by gluing a piece of dark wood to the waste stock as explained above. When the glue is dry, it is turned down to 3/16 in. in thickness and made perfectly level and flat. The next layer of light wood is glued in place and faced off, followed by the dark layer and then the final light layer. When the required layers, reduced to the proper thicknesses, have been glued together in this way, the stock is ready to be turned. The cover for the box is built up in the same manner. The first lay of light wood is 2 in. thick and is screwed directly to a faceplate. This is faced off and followed by a dark layer, this in turn by a light layer, and this by a dark layer. Fig. 61. - How layers of woods of different colors are glued together for making an inlaid box. As the cover must be of exactly the same diameter as the lower part of the box, these two parts are put together as shown in Fig. 59 at E, smoothed, and sanded. The dead center is run into that part of the cover from which the knob is turned. This adds to the stability of the box during the final smoothing and sanding. The knob is the last part of the box to be turned. This is easily done while the whole box is mounted between centers as shown at E. Enough material should be left on the knob when the cover is cut off so that the mark made by the dead center may be entirely cut away. In all inlay work it is well to remember not to have too violent a contrast between the inlay and the inlaid surface. If, for example, imitation ebony (ebon-ized wood) and maple are used for the jewel box, the maple should be stained a darker color such as amber, which resembles antique maple. After completing the trays and boxes, the woodworker who has followed this series of articles should be able to analyze and determine for himself the best way to do any ordinary job in spindle and faceplate turning. The nut bowl, Fig. 60, is turned by the "glue-to-waste-stock" method as explained before. The design may be modified so that a small circular block is left in the center similar to the one shown in Fig. 57 at C. In this case, however, the block is not removed. Instead, small holes are bored in it for receiving the nut picks when not in use. The fruit dish, Fig. 60, consists of two parts. The base is turned between centers in the usual way. The top may be turned in the way the covers of the boxes were turned (see Fig. 59, D). It has to be chucked so that a hole may be bored in its underside for the 3/16 by 1 ½ in. tenon on the base. In gluing the parts, leave the upper part in the chuck and center the lower part by running up the dead center.